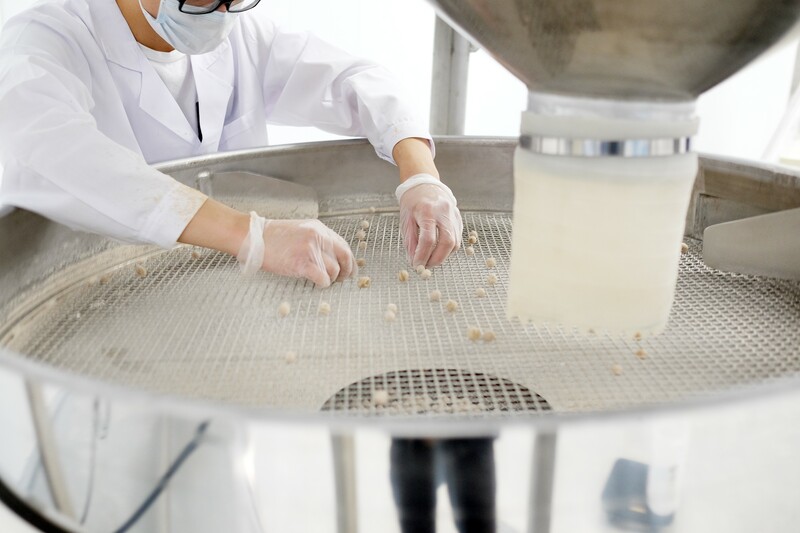 Boba Guys is the first U.S. company to make tapioca balls — at its East Bay facility. Making boba, the (usually) dark brown pearls sitting at the bottom of a cup of bubble tea, is a lot harder than it looks. No one knows better than the guys from Boba Guys, an artisanal bubble tea shop that opened as a pop-up in 2011 in the Bay Area, now with a dozen brick-and-mortar outlets in San Francisco, New York, and Los Angeles, and soon expanding to other locations. Andrew Chau, one half of the founding partner of Boba Guys (with Bin Chen), said he’s been thinking about making their own boba since they first opened shop. It just seemed like a reasonable trajectory for a high-end bubble tea shop making classic boba drinks along with their own signature drinks, house-made syrups, and grass jelly, and using organic milk from Straus Family Creamery. “I thought, if we’re going to do craft, artisanal boba, it was only natural to have our own tapioca one day,” Chau said. But being able to actually make boba from scratch — which is essentially tapioca made from cassava flour, plus several other ingredients — turned out to be a bigger feat than expected; one that no one else is doing in the United States. Bubble tea is a drink that originated in Taiwan in the ’80s, spreading soon after to parts of the U.S., such as the San Gabriel Valley. The boba craze has definitely hit the Bay Area, including the East Bay, where teens nowadays sip on bubble tea as much as, if not more than, drinks from Starbucks. Chau said he faced a lot of discouragement — making boba in the U.S. meant higher costs than importing tapioca from Asia, and that was just one obstacle. “As Boba Guys were growing, I was tempted every single time,” Chau said about wanting to make the tapioca in-house. About three years ago, Chau re-connected with David Fan, who owns Fanale Drinks, a bubble tea supplier based in Hayward, and Teaspoon, a bubble tea shop chain. Fan was on board — he had some know-how, and Boba Guys had the brand. The three of them — Chau, Chen, and Fan — started US Boba Company. Currently, their Hayward-made boba is used exclusively in the Boba Guys and Teaspoon shops. But down the line, they hope to become a supplier to other shops and chains nationwide. In a year, they hope to begin tours of their Hayward factory to demystify the boba-making process. Chau said their 18,000-square-foot factory has the capacity to supply boba balls for the majority of bubble tea shops in California and beyond. So far, so good. They started rolling out their Hayward-made boba in August, and within the next few weeks, all of their Bay Area shops will use their own boba. … In other food news, Gov. Jerry Brown signed the “Craft Distiller Op-pour-tunity” Act — SB 1164 proposed by state Sen. Nancy Skinner, D-Berkeley, allowing small craft distillers to sell directly to the public, which we wrote about in May. In other East Bay beverage news, several of our local breweries won prizes at the 2018 Great American Beer Festival presented by the Brewers Association. Drake’s Brewing Co. in San Leandro won a gold medal, Original Pattern Brewing Company in the Jack London neighborhood won a silver medal, and 21st Amendment Brewery in San Leandro and Faction Brewing Co in Alameda won bronze.